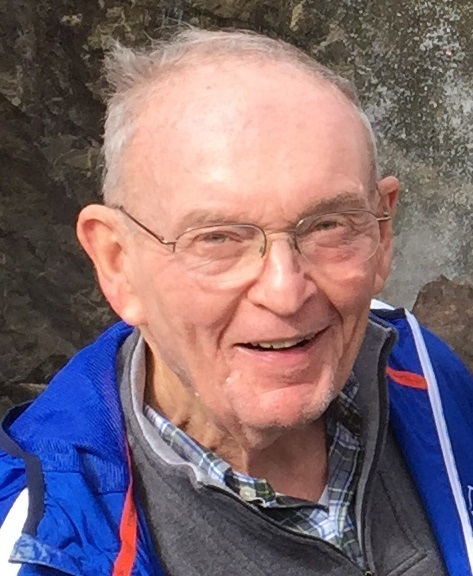 William Robert Perkins, “Bob” passed away peacefully on December 5, 2018, at the age of 79 surrounded by family. He fought a valiant 14-month battle with gastric cancer complicated by his ongoing struggle with Parkinson’s disease. Through it all he never complained or lost his characteristic sense of humor. He was beloved husband of Ginny (McMillin); loving father of Betsy and Bob (Kristin); ever loving Gramps to Quinn, Clarke, and Tatum; favorite brother of Jeanne Hofferkamp and Marsha Austin (deceased); and Uncle Bob to many. Bob attended Sidwell Friends School in Washington, D.C., graduated with honors from Amherst College and received his MBA with distinction from Northwestern University. He started his career at Central National Bank of Cleveland (later Society) where he rose to the Office of the Chairman serving as Treasurer. After 25 years in banking, he changed direction and became an independent financial advisor helping many over the next 20 years. Bob worked hard and played hard. He enjoyed life and loved connecting with friends at the Tavern Club, Shoreby Club, Rowfant Club, and the Cleveland Skating Club where he served as President in the 80’s. He had a passion for racquet sports and played tennis and paddle for many years. Bob loved the challenge and tranquility of fly fishing and walking the beat. In later years he and Ginny enjoyed playing golf while they wintered in Florida. Over the years, they travelled much of the globe but Bob’s happy place was spending summers at the family cottage in Chautauqua Institution. Nothing could compete with happy hour on the porch in Chautauqua listening to the bells play. Giving back to the community was very important to Bob. He served on the board of numerous charities including Suicide Prevention, the Deaconess Foundation, and the Center For Arts-Inspired Learning (formerly Young Audiences of Northeast Ohio) where he served as board chairman. Recently, the importance of cancer research became his focus. In lieu of flowers, the family suggests donations to UH Seidman Cancer Center, P.O. Box 94554, Cleveland, OH 44101, the Center for Arts-Inspired Learning, 10917 Magnolia Dr., Cleveland OH 44106, or Plymouth Church, 2860 Coventry Rd., Shaker Hts., OH 44120. Funeral Services will be held Thursday, December 20, 2018 at 4:00 pm at Plymouth Church, 2860 Coventry Rd., Shaker Hts., OH 44120 with a gathering to follow at the Cleveland Skating Club, 2500 Kemper Rd., Cleveland, OH 44120. Interment will be at a later date in the Chautauqua Cemetery, Chautauqua, NY.